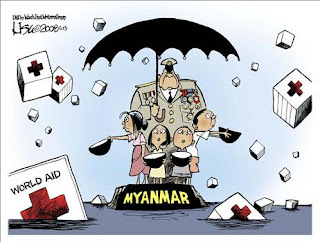 On my last post, I mused over whether the response of the Myanmar Junta was driven by stupidity or schmutz-infested souls. After further review of their conduct, I'm convinced that its a case of abject evil, pure and simple. This is a case that truly cries out for intercession on behalf of the citizens of Burma, and imprecatory prayer that the Almighty would smash the jaws of the Junta.